It is no doubt that abstract games saw their heyday back in the 90’s and early 2000’s. This is obvious to us by what we find at the thrift store every week. Back then there were scores of new titles every month from Hasbro, Mattel, Parker Brothers, etc. that all tried to become the next Chess or Checkers. Some became household names, most failed. But we’ll still continue to buy them at Goodwill for our Thrift Treasure series! Games today are expected to have something new and shiny in order to be successful. 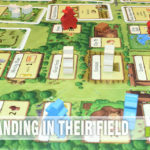 Kickstarter is full of games with plastic miniatures, whether the game needs them or not. Metal coins and spot-UV printing on the box are all the rage. And don’t get me started on legacy games – you know, the ones that you only play once and then destroy parts of the game in order to continue! I’ve been pretty vocal about the type of game I prefer most – abstracts. And it seems like there aren’t too many in development any longer as consumers’ attention is focused elsewhere. Until now. 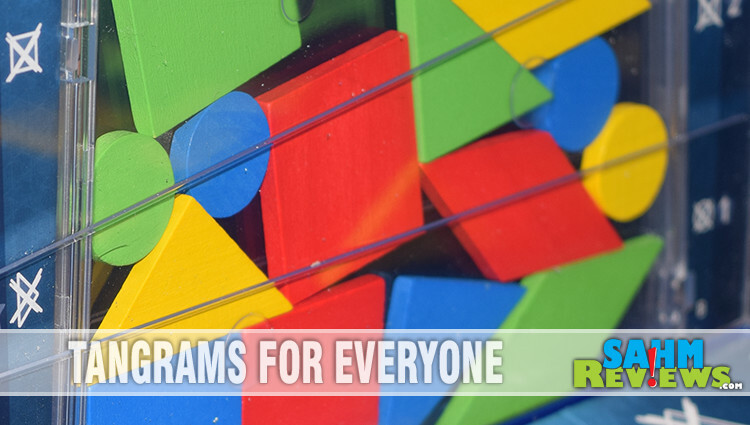 Kosmos has stepped up to the plate with a brand new abstract game, Drop It, that combines tangrams and Tetris in a quick and simple game of letting the chips (pieces) fall where they may! Inside the box you’ll find a large plastic Drop Zone that will remind you of Tetris or Connect 4. 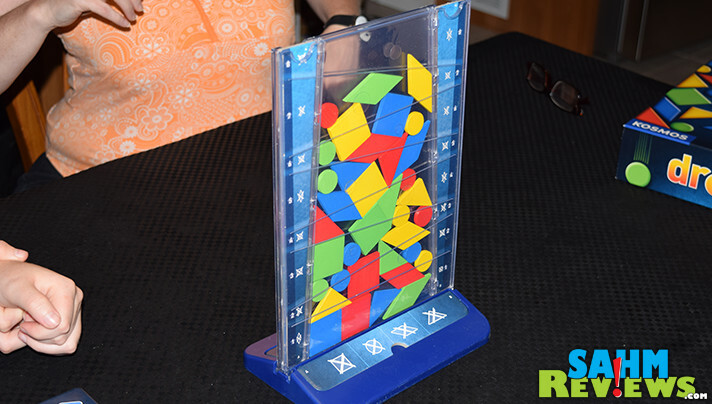 Thirty-six plastic pieces in four different colors allow for up to four players (or two teams) at a time. And a handy Scoring Track with corresponding colored markers will help you keep track of points as the game progresses. Each set of nine plastic pieces is made up of four different shapes (square, triangle, diamond, circle) and all sets are exactly the same. 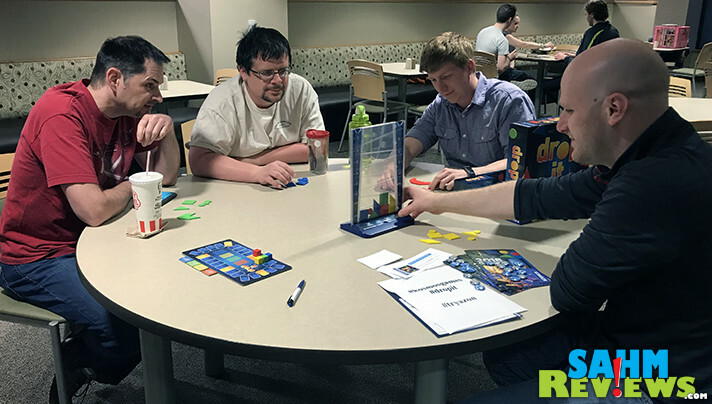 On each players’ turn they will choose one of the shapes in their pool and drop it in between the two plastic panes of the Drop Zone, letting it fall to the bottom. After your dropped piece comes to rest, you will examine it to determine if you have scored. Your piece may not touch another piece of the same color or shape, nor may it touch the sides or bottom of the Drop Zone if it is marked with a matching shape or color. It also may not stick out above the top of the unit. As long as all of these criteria are met, you may score your piece. 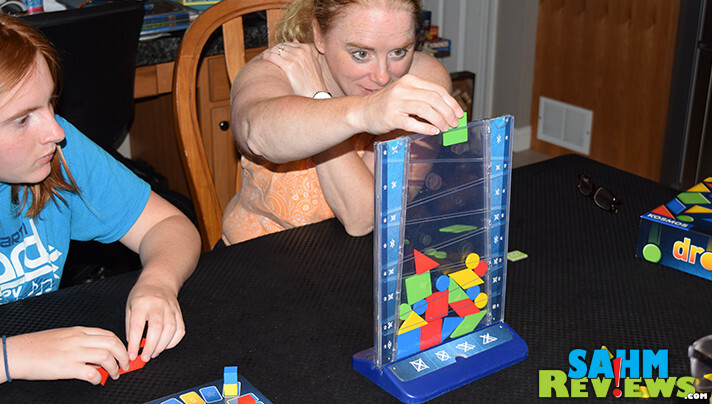 Determine the highest level in which your piece landed and earn the number of points equal to that level. Molded into the clear plastic of the Drop Zone are bonus circles. If any of these are covering any part of your piece, you will earn bonus points. One point if it is the large circle which touches yours, two points for a medium circle and three if you manage to corral the small circle! Move the pawn of your color on the Scoring Track equal to the number of points you have earned! As soon as all players have dropped their final shapes (or no valid further drops may be made), the game of Drop It ends immediately. The winner is the person with the most points on the Score Track! Tied players also share in the victory! 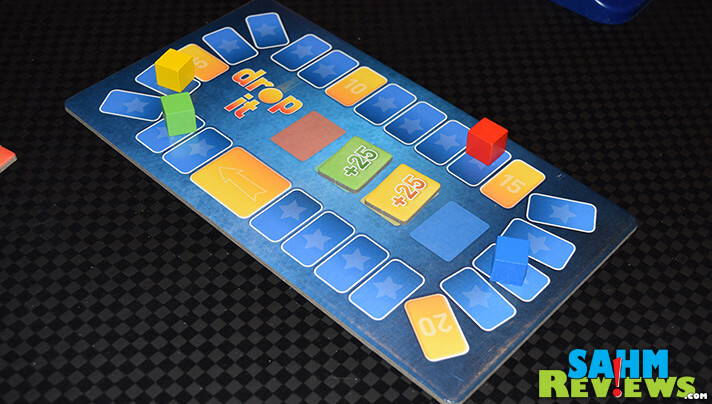 Drop It also includes a number of variations that you can employ to make the game easier (only penalties on the sides, not the bottom), jokers to allow you to forgive one broken rule per game and rules for playing as teams head-to-head! It’s like having four games for one price! 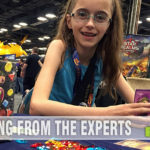 You will find Drop It available right now on Amazon, at your local game store or possibly at some big box retailers. If you’re headed to Gen Con, you can certainly pick up a copy at Kosmos‘ booth – #2648! Want to find out where else to get a copy? 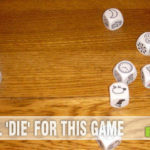 Follow them on Facebook or Twitter and they’l be happy to answer any questions you have about Drop It or anything else in their massive lineup of games and puzzles! 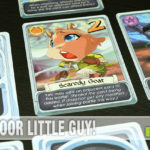 Do you have a favorite abstract (non-themed) game? I think I need to catch up in this century?! I am still into abstract games. Of course, I didn’t know they were in that category until now. I still play Tetris and we still own a Connect Four game. The girl’s face on one of the pictures look so intense! I will ask my grandkids about Drop It and see if they ever heard of it or played it. It sounds fun. This is a brand new one, so there’s a good chance they haven’t heard of it yet! It’s been a while since something new has hit the market in this genre, and this one is a pretty good one! This looks like a really fun game! I bet my two daughters would really enjoying playing this! Oh this would be fun to play with my sister. I think it might just drive her crazy that she can’t control much of anything. Of course that also means she can’t cheat. Love this… the suspense of watching where that piece will go! 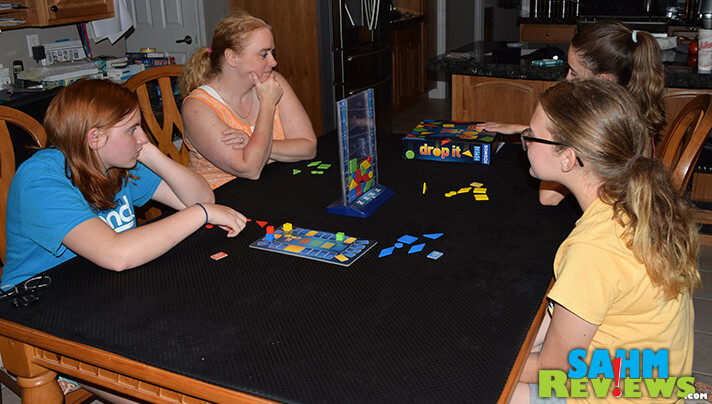 As a fan of Tetris and Connect 4 I think I need to give Drop It a try. It looks like a fun game that would be great for the family! Oh my gosh, it’s been so long since I’ve played a game like this. 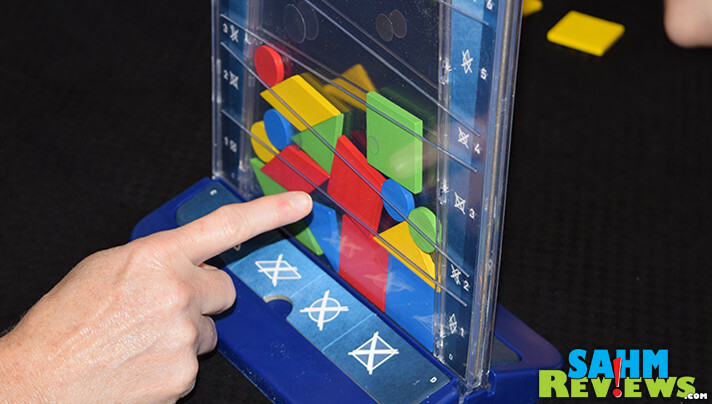 It reminds me of both Tetris and Connect 4, which are two of my favorite games. THis is such a fun way to enjoy some family time. I love shapes and such like this. Totally reminds me of Tetris, which is my all time favorite game to play!